Low Dive - Common People. 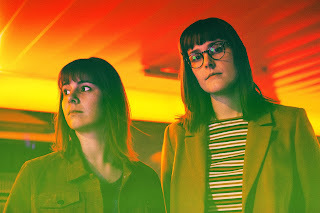 Background - Brisbane dream pop duo, Low Dive release their music video for debut single, 'Common People'. Featuring pals, pups and sun-drenched streets, the video is an ode to Brisbane's West End and it's beloved local haunts. Low Dive launch 'Common People' at The Foundry in Brisbane on Thursday 29th June with support from Pool Shop and McKisko. Facebook here. 'Common People' is a lush and dreamy song, with a laid back vibe and gentle melodic vocals, which together make for an enchanting musical piece. Slowcoaching - Pillars Of Salt. 2 by bukowski feat. Kid Moxie - Hot Summer. Background - Let's go back in a time for a bit, before 2 by bukowski had a name, before the Wire Nightmare, before even the infamous “Practice Session 0” at Studio N between George, John and Nik. It was sometime in 1996 and a band called Tiger had released a single called "My Puppet Pal". George had just bought the record and brought it over to John's place to listen to. The single came with a sticker of its cover which George gave to John who stuck it on his white Aria bass. For that reason that bass has since been and is still known as The Tiger. At some point, after having used it on several 2bb recordings, John upgraded his bass and gave The Tiger to Achilles who was cheap and would take whatever you gave him. 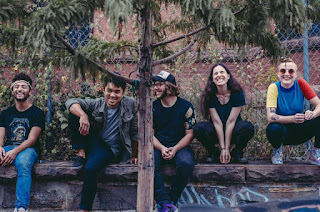 Background - Common Tongues have taken a step in a new direction with their upcoming debut album; with their sound extending towards the experimental, by its presence of electronic instrumentation and powerful song progressions. 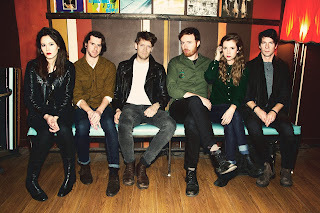 A new life is given to their powerful indie-folk music. Dancing on the boundary between acoustic and synthetic, Common Tongues use intricate harmonies, searing violins & bubbling electronics to create absorbing live experiences and records that reveal immersive arrangements and lyrical themes of conflict, decline and rebirth. Eat The Evidence - Fruit Of The Loot. A satirical account of the artistic trappings of the British Empire set to supercharged-ska, ‘Fruit Of The Loot’ is a tongue-in-cheek yet brutally honest address to all those nations, from Greece to Chile and beyond, whose prized cultural artefacts have been pilfered for exhibits in UK museums and galleries. It’s all set to an astonishingly agile brew of agit-ska – all dubby bass, fiesta beats and, yes, that is a slide-whistle solo. The video captures the band dressed as colonialists, visiting the stolen artefacts at the British Museum. Background - Caretaker are a rock band from Brooklyn that formed from the ashes of several other popular Brooklyn bands. They deliver high-energy rock songs that make you want to dance just as much as they make you want to punch a hole in your wall. Long after you’ve left the venue, their melodies will get stuck in your head and their memory will be burned in your mind. They are fronted by a real-life nanny. Members: Erin Pellnat, Eva Lawitts, Alex Pulakos, Damian Sim, and Chris Krasnow. “Swallow” is a song about being trapped in a relationship (or any situation, really) where someone is successful in convincing you that you are constantly wrong. This gets to the point where you believe everything they say, gladly taking punishment and abuse from them and wrongfully accepting that you deserve it. So you just cut ties and set yourself free. Website here, Facebook here. Secret Bad Boy - Chicken / Double Platinum. 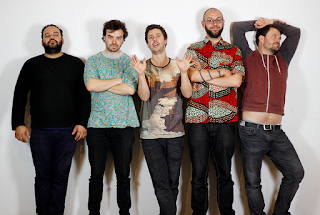 Background - After completing a successful mini-tour opening select dates for London’s Happyness, Secret Bad Boy is back in Chicago with a show scheduled for Schuba’s Tavern on Thursday, June 15. Secret Bad Boy is the new project from Ezra Furman’s longtime guitarist and keyboard player, Ben Joseph, and the band’s recordings feature Woody Goss of Vulfpeck, Ezra Furman, Nick Tremulis, Packy Lundholm of I Fight Dragons, Noam Wallenberg, Brittany Moffitt, Mat Roberts, Jorgen Jorgensen and Sam Durkes. Secret Bad Boy has released two tracks plus accompanying music videos. Bandcamp here, website here. 'Chicken' and 'Double Platinum' are two very different songs, with one consistent feature, they are both fabulous. Actually there is more, both songs and videos have the charm of a "bad boy" the mischief is not far below the surface, plus the natural rock'n'roll is there in abundance. Fast Romantics - Everybody's Trying to Steal Your Heart. Background - Toronto-based indie rockers Fast Romantics have shared their new video "Everybody's Trying To Steal Your Heart". The band just released their latest LP American Love. Produced by the dynamic duo of Gus Van Go and Werner F (Arkells, Wintersleep, Hollerado), American Love is the follow-up record to Fast Romantic’s 2013 release, Afterlife Blues. Written and recorded over two years, alternating between Toronto and Brooklyn, American Love is a nod to the type of cinematic storybook romance American pop culture has conditioned us to search for, but also explores the realities at play off the silver screen that can wreak havoc on burgeoning love. We live in a time of political and social turmoil, and the twelve songs on American Love don’t deny this, each one marked by poignant references of the time and place in which they were conceived.